Copyright ©2016 Jorge Diaz-Amador, all right reserved. See below for terms. 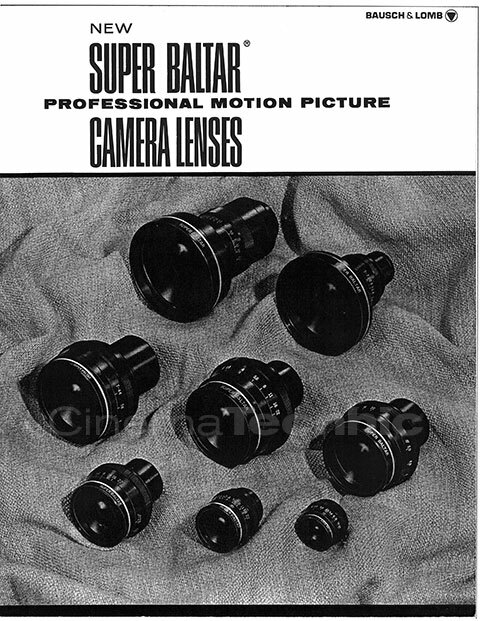 Super Baltars are a improved series of cine lenses introduced by Bausch & Lomb (B&L) in late 1966 superseding the original B&L Baltars, and designed to be compatible with the new spinning mirror-reflex Mitchell BNCR introduced in 1967. The Super Baltars have new optical designs and benefit from new glass types that became available after the introduction of the original Baltars. Super Baltars are also optimized for color cinematography. Super Baltars have iris rings with constant angular rotation between stops (evenly spaced f-stops). Quite unlike modern lenses, the Super Baltars were supplied from the factory as optical units comprised of the complete optics and an iris diaphragm in a housing. The focusing units and lens mounts were considered separate items. Information on when the Super Baltars were discontinued is hard to come by. Bausch & Lomb’s great success in the consumer market with contact lenses and sunglasses most likely made the less profitable camera lens department a target for cutbacks. Their optical glass plant closed in 1985 and it is very likely that lens production ceased well before that. Bausch & Lomb also made projection lenses called Projection Baltars. According to B&L the Super Baltar’s “Coma and spherical aberration are negligible.” While this statement may have been true from the mid-1960’s perspective, my testing has shown significant amounts of spherical aberration compared to modern lenses, which also causes very significant focus shifts while stopping down. However, when lenses with under-corrected spherical aberration are used on digital cinema cameras, a unique optical phenomenon occurs. The glass situated in front of the sensor plane (photosites), which comprises the sandwich of the protection glass, the infrared (IR) filter, and the Optical Low Pass Filter (OLPF), has a significant thickness. This acts like an additional lens element and tends to improve the correction of spherical aberration, at least in the center of the image. So it can be said that vintage lenses with under-corrected spherical aberration can achieve better optical performance on a digital cinema camera than they could on a film camera. 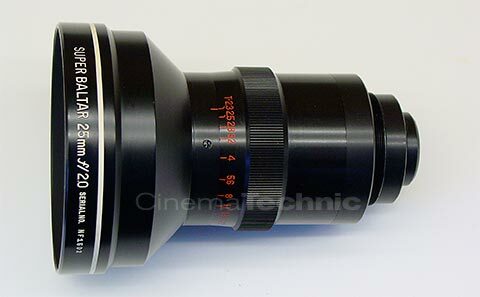 There is also the intangible effect that is produced when a vintage cine lens is used on a modern digital cinema camera. The rigid “grid” nature of the digital cinema camera’s sensor pixel array, combined with the sensor’s high MTF at moderate spatial frequencies (below the level that is affected by the OLPF) tend to produce an “overly sharp” effect. The vintage cine lens tends to balance this out and produce a pleasing synergy. I call this the “analog-digital synergy”. It is similar to an effect that audiophiles have found where combining digital audio equipment with vacuum tube amplification produces a pleasing synergy of sound. The softness and warmness of the analog technology, vintage lenses in the case of video and vacuum tubes in the case of audio, which may have been considered flaws in the past, happen to have just the right effect to balance out the aesthetic flaws of the new digital medium. In general, the Super Baltars should be considered low contrast lenses by today’s standards. MTF at 25 lp/mm on-axis was much lower than modern lenses. Of the set, the 50mm and 100mm SB’s had the best contrast wide open. The wider angle Super Baltars 20mm, 25mm and 35mm showed a broader focus curve than modern lenses. This means the image comes into and out of focus much more gradually than with a modern lens. This is considered part of the “look” and is sometimes referred to as “deep focus”. At wide-open aperture, MTF at 50 lp/mm was low (<30%). The through focus curves were asymmetrical, and these lenses tended to have more depth of focus ahead of the point of best focus than behind it. The 50mm, 75mm and 100mm Super Baltars gave a different result. Their through-focus curve was also broad and asymmetrical, but in the opposite direction, with more depth of focus behind the point of best focus than in front of it. The 50 and 100mm Super Baltars had slightly better MTF at 50 lp/mm than the wider lenses (<40%), the 75mm had the same MTF as the wider lenses. The 50mm Super Baltar showed a focus shift when stopping down of +70µm between T2.3 and best MTF (64% @ 50 lp/mm) at T9.5. This is a much larger focus shift when stopping down than is seen with almost any modern cine lens. On the technical merits, any relatively modern cine lens (post 1978) will easily outperform the Super Baltars. But it is not the technical optical performance that cinematographers are after, but a pleasing optical effect and/or an optical signature. It can certainly be said that the Super Baltars are lenses with personality. Kowa of Japan produced a set of lenses that are copies of the Super Baltars. The anti-reflective coatings are not the same, so the Kowa’s have their own unique look. Since all the Super Baltars have significant focus shifts when stopping down, and this effect will be exaggerated by the glass pack in front of the sensor of a digital cinema camera, the old rule of focusing wide open and then stopping down to shoot needs to be thrown out. My suggestion is to only focus at the exact same stop you will be shooting at for best results. Some Super Baltar lenses use glass formulas incorporating radioactive thorium oxide. Thorium glass was used because it has some of the same properties as calcium fluoride helping control chromatic aberration. Thorium is radioactive. The 20mm Super Baltar seems to use the highest amount of Thorium. Avoid keeping the lenses close to your body. The energy levels emitted by the lenses are not dangerous at distances over 3ft (0.9m). Plan ahead if you will need to pass through security (such as commercial air travel) with these lenses as you will likely set off radiation detectors. Note: The Birds Dir. Alfred Hitchcock / DoP. Robert Burks is frequently listed as being shot with Super Baltars, but its production pre-dates the Super Baltars by several years. It was most likely shot with the original Baltars. Above: Super Baltar 100mm f2 (T2.4) showing asymmetrical through-focus MTF curve for 50 lp/mm. Lens was tested at 6ft focus distance. The assymetrical through-focus MTF result is a result of the vintage optical design. Modern lenses tend to have symmetrical through-focus MTF curves.